What a busy week this has been! St Patrick’s Day in Canberra Australia (17 March) saw Full Circle playing at PJ O’Reilly’s Irish pub in Civic. We set up and played our first set then an Irish dance school came in and performed, and we took it in turns – whenever we took a break, the dancers were on, and the crowd loved it. When we finished the three brackets we had only a few minutes to pack the sound gear away and head off to Kingston where we played at Filthy McFadden’s Irish pub – if PJ’s was good, Filthy’s rocked. We introduced a few new tune sets, including Paddy Fahy’s #14 and Dinky Dorrian’s which I’ve wanted to play for ages. And for Dinky’s reel I made full use of the new long lead to head for the dance floor out among the audience – and they loved it. Suddenly I was surrounded by mobile phones! All frantically taking photos! We met some great people and had two great shows – although the voice was a bit hoarse and the fingers a bit tender after six hours of playing and jumping around. Music sure keeps you fit! It promised to be a warm ride as I strapped the fiddle to the back of the motorbike for the run down to Majors Creek near Braidwood in New South Wales, about 114 km from Canberra. I dressed lightly beneath the outer armour, but hadn’t reckoned with the cloud into which I ascended on the final approach into my destination. Majors is one of the best folk festivals in Australia – smaller and more intimate than the National, but large enough to attract the major acts. I entered to the delightful harmonies of MusicOz 2008 winners Mothers of Intention. Tony Pryzakowski’s fiddle playing was unmistakable from the first notes, as were Rosie McDonald’s harmonies. This is a band that just keeps getting better. Out on the oval, a Maypole dance was being woven with a morris dance team and a crowd of willing participants. Bizerka’s energy and amazing rhtyms delighted the crowd, and the concentration of the fiddler was palpable as she played 7/8 and 5/8 rhythms. They ran a workshop on using phrases to make complex rhythms more comprehensible. 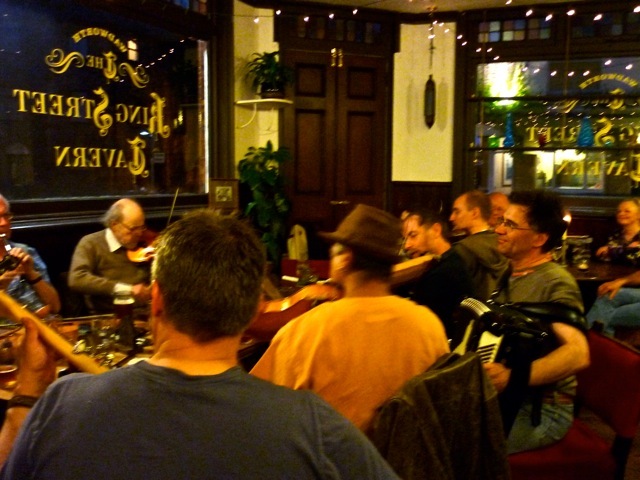 The Fiddler’s Forum showcased great playing across a range of styles, from celtic to bluegrass and Eastern European. But for me the sessions as always were the highlight. 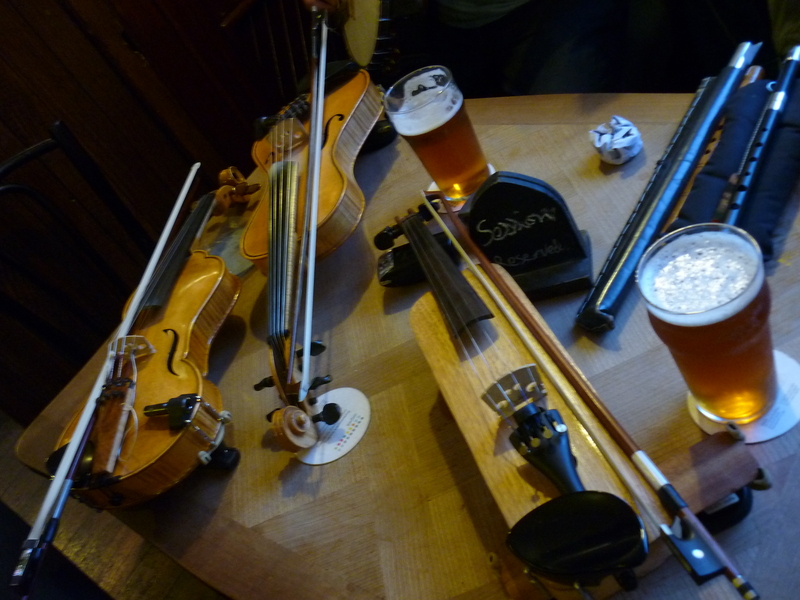 The pochette attracted attention – as did the hardanger fiddle (hardingfele). I met old friends and played music with new ones. 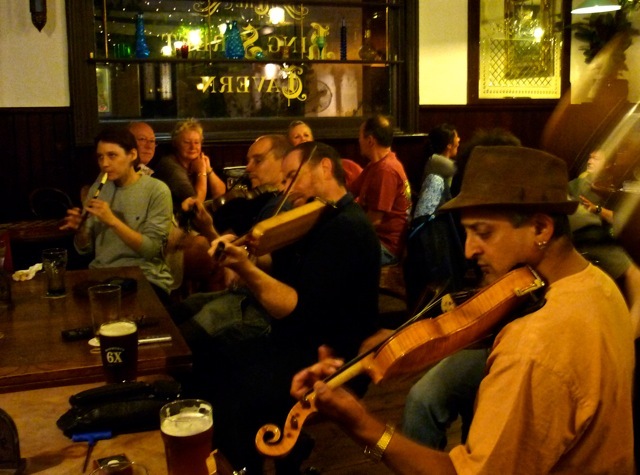 Tony and I had our by now traditional ‘dueling fiddlers’ playoff – someone thought we were from the same band! Let alone different cities. We are well matched. Trad and Now Trad & Now aims to promote, preserve and support the cultural diversity and heritage of all traditional and contemporary folk music and related performance arts such as poetry, dance, storytelling and folklore and to encourage this as part of our everyday lives. And the subscription is amazing value! I love the news about festivals in Australia and elsewhere, the developments in folk, blues, roots and world music and the tunes being highlighted in each issue.